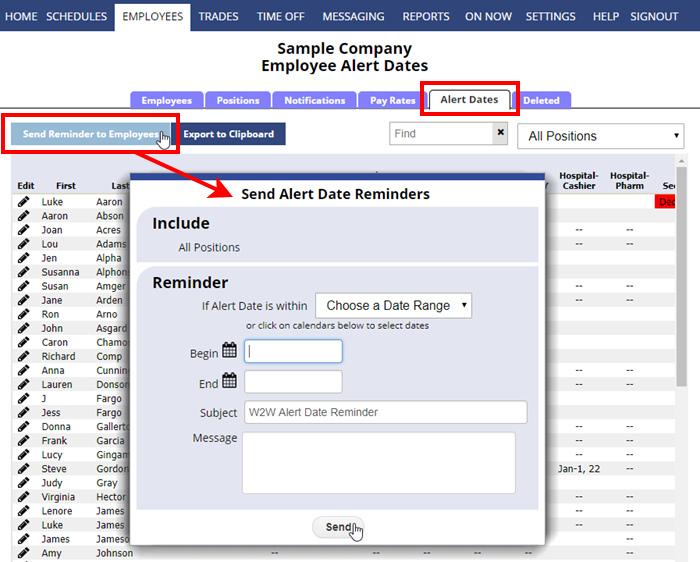 Managers (with permission to edit employees) can send alert date reminders to employees. Once the alert dates have been entered, you can then send reminders to employees who have email notifications set up to forward W2W messages. These can be used, for example, for certification dates, to remind employees that a certification date is upcoming. Type a message that will be sent to the employees. The content of your message is the complete email they will receive, so be sure to include all the pertinent details about their alert date and what it means. Employees are only sent a reminder if their alert date is within the range chosen AND if they have their email notifications set to forward messages.